First and foremost a big thank you to Sylvain Hartist who sent me this sample! And also a thank you to Johan Blom and Martin Ahlquist who suggested I’d review this specific sample. This is a bottling by the independent bottler Berry Brothers & Rudd, where they in 2014 bottled a 25-year-old cask from the now closed Lowland distillery Littlemill. Littlemill was founded in 1772, even if the distillery, according to some sources, is mentioned already some decades earlier. The distillery was mothballed two times,once in the 1930’s and once in the 1980’s, but 1992 it was closed for good. Up until the 1970’s they distilled three different types of whisky here, the peated Dumbuck, the rich Dunglas and the light Littlemill. It is a sample of the latter i will review today, a bottling that – judging by the distillery year alone – should have been distilled during the last mothballing period, which in a sense is a bit of a contradiction. Perhaps the distilled a tiny amount in order not to forget how it was done, like a liquid post-it? Probably not, but what do I know. If you know the true story, let us know (yes, I’m looking at you David “Whiskypedia” Tjeder!). General facts: The whisky was distilled in 1988, four years before closing down productions at Littlemill, and was bottled in 2014. The cask had the number 57 but even though I’ve done some light digging online I can’t find any specifications as to to which kind of oak of cask that was used during the maturation process. Give us a shout if you know, please! The whisky has an ABV of 46% and has neither been artificially coloured nor chill-filtered. Nose: Apple juice, wax (candle wax), a slight spirit note further down in the glass, fruit candies, rosé pepper and something just a tiny but stale behind all the fruitiness: Old fabric? Cottage? Difficult to say. A bit of sweet mint, quite a bit of canned pears and a touch of creamy almond paste. The nose feels quite youthful at first, but shows another kind of depth and maturity after a while. It’s kind of ingratiating initially with a lot of wax and fruitiness, but then other, a bit more raw or robust notes emerges, which makes the nose more interesting. With water the nose turns sweeter, more sugary, and a faint citrus notes finds its way forward. This is a nose that makes me curious, for sure! Taste: Wow, a bit more peppery and aggressive than I had expected! And the slightly tangy fruitiness from the nose is much sweeter now. The fruit is more cooked than fresh and that fresh apple juice has been switched for some fruit cocktail in syrup. The body of the whisky if round and delicate with a clear oakiness and bourbon cask notes to it, which transforms into a coffee note at the end. The almond from the nose is still there. 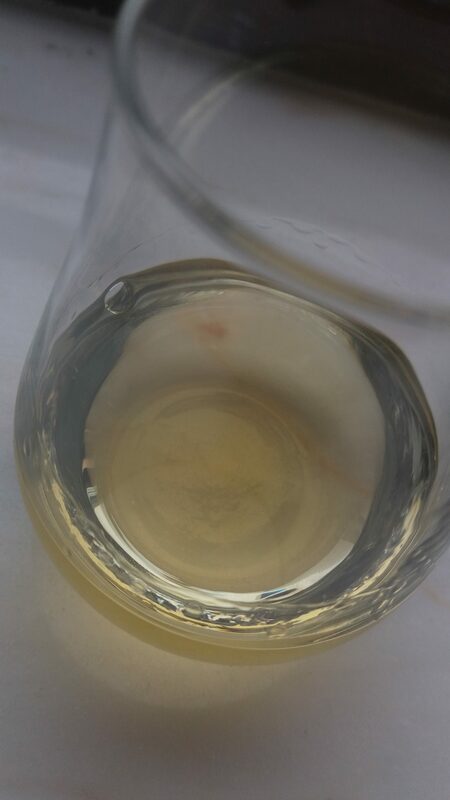 After adding some water to the whisky the taste grows bigger and bolder, and it feels like it opens up much more. The oakiness is toned down and some fresh fruits in the shape of peaches and really sweet grapes emerge. This is evidently a whisky that gains from a few drops of water added! Finish: The coffee is still noticeable in the aftertaste, together with a sort of herbal note – kind of like lemon balm. Some vanilla and caramelised sugar are tangible too. The finish is not that impressive, and without water the whisky’s strength is in the body of the taste. However… after adding water I get to eat my words – what a difference! The finish grows longer, cockier and bolder with just a few drops, with caramel, some sage, fresh pears and a big dollop of sweet licorice. Perhaps also a slightly salty sensation at the very end, too, but of that I’m not sure. In any case yum! This is a typical example of why watering your whisky can be a good thing in order to notice layers and development within the whisky, ‘cause my God what a difference it made in this case! Before adding water I wasn’t too impressed, to be honest, and I found that the nose promised more than the taste (especially the aftertaste!) could keep, but that changed quickly with just a few drops of water. What a complex little bugger this whisky is! It’s a shame that Lowland whisky sometimes is overseen (I’ve even once heard the incredibly ignorant comment that “Lowland whisky is women’s whisky”… I mean, come on!) when it can demonstrate such an interesting and complex character like this.